Yesterday was Pancake Day, so Matt made me pancakes for dinner. Well, actually we had planned to have these pancakes this week before we realized it was Pancake Day, we just got lucky. We were just looking for a good vehicle for the cloudberry jam we brought back from Sweden. Cloudberries are a tart fruit similar to raspberries and blackberries that are typically found in the Nordic and Baltic countries as well as parts of Canada. We've never been able to find them in the states, so we were excited to bring some home. We really like there flavor, but they are quite seedy, even more so than raspberries. Ok, back to the pancakes. Matt thought it would be good to add a savory element to them, so he picked up a local soft cheese that was quite similar to a brie. The tangy, funkiness of the cheese was a perfect pairing with fruit. 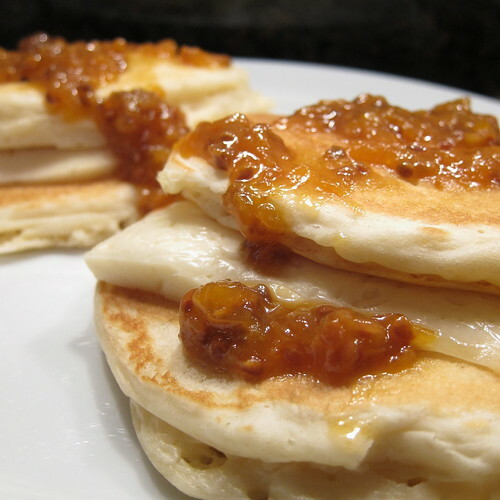 We put a layer of cheese between to hot pancakes making the cheese all melty and runny and then topped it with the jam. It was a great brinner, but would also be wonderful for a brunch. 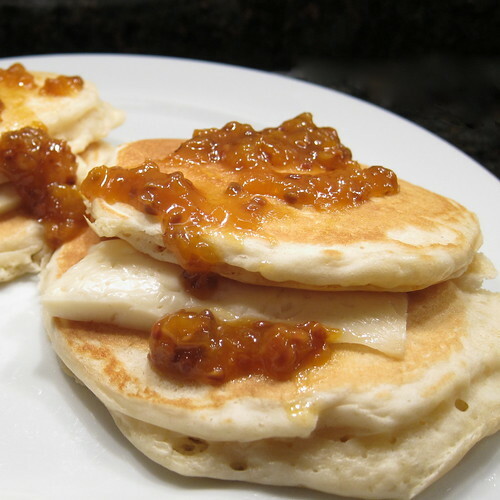 No other recipe here, but I'll share Matt's tricks for making a tastier, fluffier pancakes with Bisquick. He adds one more egg than the recipe calls for and uses buttermilk instead of milk. He stirs in the eggs first and then adds the buttermilk until it reaches his desired consistency. He adds a touch of vanilla for a little more flavor. Finally, he lets the batter sit for 10 minutes before using, he says the batter even rises a little in the bowl while resting. Hope you all had some great pancakes yesterday too! i completely forgot we could have pancakes for dinner yesterday. bad foodie. I've never heard of cloudberries. I'll have to look up where they're available in Canada. Oooh....they're called bakeapple here, which I have heard of before. I remember seeing jams and pies in Newfoundland and assuming that it was some sort of baked apple. This recipe looks heavenly and I will have to make it for my family that is coming to stay with us over the weekend. I'm sure everyone is going to love this recipe. But first, I have to go get the ingredients. So, its off to the grocery store I go. Cloudberries are awesome! These look great Kat and Matt! Pancakes for dinner sounds amazing! 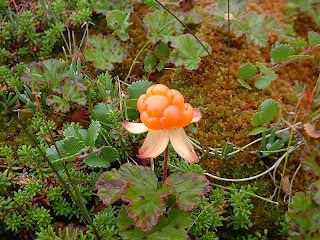 I have never tried cloudberries, I need to go find some. The pancakes look delicious. I have a wheel of brie in the fridge and this is so tempting! Something I never would have thought of. I love the idea of those berries too. A new one to me.